Developed by Kojima Productions. Published by Konami. Released March 18, 2014. Available on PS3, PS4 (reviewed), Xbox 360, Xbox One. 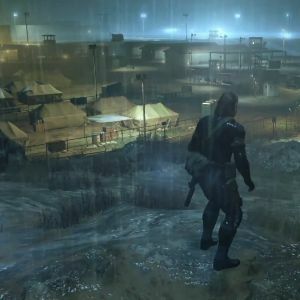 Before Metal Gear Solid II: Sons of Liberty launched, Konami released a large part of the "Tanker Mission" prologue chapter as a standalone demo. This demo, admittedly substantial for the time, was packed in as an extra alongside the full-fledged Zone of the Enders. With Metal Gear Solid V: Ground Zeroes, Konami has released another taster for an upcoming MGS title ... except this time, there's no real game included to justify the asking price. I didn't want to believe that even Konami would be quite so brazen as to charge money for a demo, but having completed Ground Zeroes, I can see no other way to describe it. Well, perhaps a more fitting term would be "advertisement." The less-than-two-hour mission found in this release will not be part of Metal Gear Solid V: The Phantom Pain, but it acts as a teaser for the real game nonetheless. It's a morsel, a scrap, a hint at something that promises to be very good. Indeed, having played this ... product ... I feel very confident that The Phantom Pain will be a great game. That said, I did not need to spend $30 to obtain such confidence. As well as the brief main objective, there are up to five optional missions - however, this feels like a desperate attempt to pad for time. The same small map is used for every single side quest, and the missions themselves aren't particularly compelling. You keep returning to the same place to eliminate targets or secure intelligence, and while these quests can take a while to complete, I just couldn't find any fulfillment in them. They exist merely to let you try and squeeze as much value as you can from a glorified commercial. A commercial that you buy. While some may try and claim the side missions justify the price, one must remember that this sort of content is usually included as an extra in a full game. They are exactly what their name implies - a side dish. Not full content. In movie terms, this is like selling a quarter of a movie on Blu-ray, then validating its price with deleted scenes and director's commentary. Is there any good news in all of this? Fortunately, yes. The gameplay, what there is of it, actually does hold up rather well, providing the familiar stealth action fans have come to adore with some much needed refinement. Controls feel quite refined, with CQC, interrogation, and map interactions feeling fluid, sensible, and quick - a drastic change over the sometimes archaic and unwieldy input schemes of past games. Little touches, such as being able to "sense" when you're being spotted, getting a chance to dispatch a foe in bullet-time before he alerts his buddies, and using binoculars to "tag" guards and keep them located on-screen, all help to enhance the stealth. Combat is still a little stodgy, but manages to be more swift and decisive than it has in the past. Controls still suffer from a few long-running issues. Some of the contextual action commands occasionally get themselves confused, and Snake himself will sometimes spasm when he gets near certain environmental objects. There is a lot of potential interactivity to assault the player's senses, and the casual user will likely be overwhelmed by MGS' nuanced controls that never quite explain themselves adequately. Once again though, compared to previous games, interacting with the overall world has been modernized and polished to a pleasant degree. Old hands will find most of the changes pleasantly offset any lingering issues. The main mission itself is pretty enjoyable while it lasts. I actually found Kiefer Sutherland's controversial portrayal of Big Boss growing on me even over the short duration of the game, and there are lots of little things to mess around with on the map. Interrogating soldiers - a favorite trick in Snake Eater - is incredibly useful, providing main mission details as well as tips on where to find new weapons and other goodies.